The branches of nerves of sacral and lumbar plexuses are the points of origin of cutaneous nerves that supply the lower limb , the exception being some proximal unisegmental nerves that originate from T12 or L1 spinal nerves. The lateral and posterior cutaneous nerves of thigh and cutaneous branches of the femoral nerve are responsible for majority of cutaneous nerve distribution supply, their name explains their distribution. The medial part of thigh is greatly provided, also by, anterior cutaneous nerves from the femoral nerve along with anterior part of thigh. 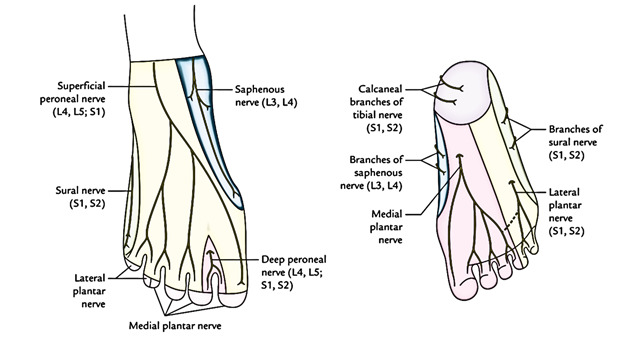 The cutaneous distribution of nerves of the leg on its anteromedial aspect is supplied by the saphenous nerve, the posterolateral part by the sural nerve, and the anterolateral part by the superficial paroneal nerve. The superficial paroneal nerves usually supply the cutaneous nerve distribution of dorsum of the foot. The cutaneous branches of medial and lateral plantar nerves distribute the cutaneous nerves in the sole of foot. 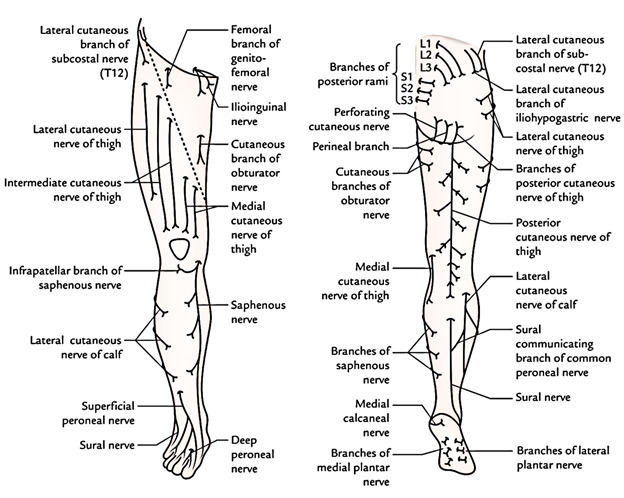 The cutaneous nerves are explained in detail with specific regions of lower limb.